Note: Due to construction at Sylvan Lake State Park, lake SUP trips are not available in summer 2018. Colorado River trips remain available and are recommended for experienced SUP paddlers.Timberline Tours offers the Vail area’s only still water, stand up paddle board, or SUP, tours at Sylvan Lake State Park. This pristine location up the Brush Creek Valley, near the foot of the Sawatch Mountain Range, offers an amazing backdrop for a day on the water. Sylvan Lake State Park is the perfect location for an introduction to the fantastic sport of stand up paddle boarding because its still water is conducive to learning and developing confidence; plus, it’s a great place to relax and spend a day out in the mountains. Those with a bit more stand up paddle board experience may be ready to take on moving water. 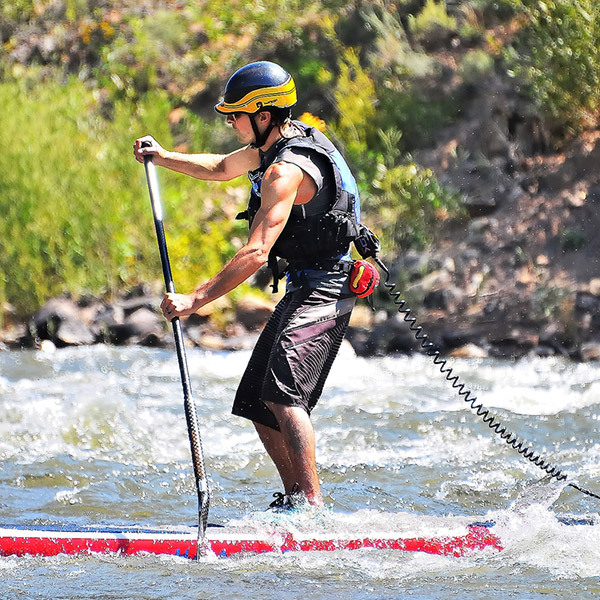 Our SUP river trips in the Vail area take place on a stretch of the Colorado River. These trips are a thrill and only recommended for experienced paddle boarders or for those with a bold sense of adventure. 4½ hours; pick-up time at 8:00 a.m.
Generally, the minimum age for this trip is 13 years old in order to have an individual board; those under the age of 13 may share a board with an adult. Please note: Age minimums may be considered individually based on guides’ discretion, so please give us a call to discuss.